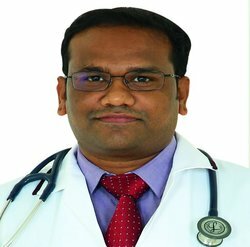 Dr. Kiran Kumar Mukku is a consultant Nephrologist with an experience of 14 years. He pursued MBBS and MD General Medicine in one of the premier medical institution of India – JIPMER, Puducherry and went on to complete DN Nephrology from NIMS, Hyderabad. He is well qualified to treat all kidney related ailments including Chronic kidney disease ( CKD), Acute Kidney Injury (AKI), Nephrotic syndrome, Diabetic Kidney disease, glomerular diseases, Hypertension, Renal stone disease, Urinary tract infections, Acid-base disorders, Electrolyte abnormalities. He is a specialist in all forms of dialysis – hemodialysis, peritoneal dialysis , Continous renal replacement therapy ( CRRT), Hemoperfusion, plasma exchange and has been pivotal in starting and developing Dialysis and Renal Transplantation programmes at Virinchi Hospitals, Hyderabad. He oversees around 1500 hemodialysis sessions per month at Virinchi Hospitals. He has been involved in management of more than 300 kidney transplants and is an expert in evaluation and treating all complications of kidney transplantation. He is well versed with nephrology related clinical procedures like insertion of temporary dialysis catheters – jugular and femoral vein cannulations , tunnelled dialysis catheters , percutaneous peritoneal dialysis catheter insertions. He has performed around 1000 kidney biopsies and can handle any possible complications of kidney biopsy. Dr Kiran has published good number of articles in both national and international journals. He has delivered lectures in both local and national conferences & CME programmes including Peritoneal Dialysis Society of India conference (PDSICON 2018) , Telangana State Nephrology conference (TSNCON 2019). He also presented papers in International meetings – European Renal Association – European Dialysis & Translant Association ( ERA-EDTA 2018). He has contributed chapter in ‘ Nephrology for Physicians – Chronic Kidney Disease’. He is a Member of Indian Society of Nephrology (ISN) and Indian Society of Organ Transplantation (ISOT), Life Member of Indian Medical Association. His fields of interest are Kidney Transplantation and Glomerular diseases. Mukku KK, Devaraju SBR, Surendra M, Chandragiri S, Suresh A. Intra-arterial thrombolysis for acute thrombosis of Arterio-venous fistula: Experience at tertiary care centre; Submitted manuscript to Artificial Organs. SB Mandarapu, KK Mukku, SB Raju, S Chandragiri – Successful Catheter Reinsertion in a Case of Paecilomyces varioti Peritonitis in a Patient on Continuous Ambulatory Peritoneal Dialysis. Indian J Nephrology – 2015 May – Jun; 25(3): 177–179. Goli, K. K. Mukku, S. B. R. Devaraju, M. S. Uppin – Acyclovirinduced Thrombotic Microangiopathy; Accepted for publication by Indian Journal of Nephrology Nimmagadda S, KK Mukku, SBR Devaraju, MS Uppin. Unusual Cause of Glomerular Deposition Disease: Collagenofibrotic Glomerulopathy, a Case report. Accepted for publication by Indian Journal of Nephrology Seminars / Conferences / CME’s Attended.